This is a really cool way to serve pumpkin as either a side dish or a starter (although I'd probably eat this as a main course!). It uses creamed spinach and creamed cheese which both work brilliantly well with the sweet, roasted flavour of the pumpkin. Cut the top off of each pumpkin and scoop out the seeds. Spread 2 tbsp. butter over the inside of each pumpkin and season with salt and pepper. Put the top of the pumpkin back on, then put into a deep baking tray with a little water in the bottom. Cook in a 180C oven for 30 minutes, then remove from the oven. Mix the creamed spinach and cheese and season with salt and pepper. Divide between the pumpkins. Top each pumpkin with a slice of cheese. Put back into the oven for 10 minutes or until the cheese has melted. 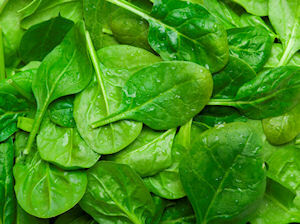 You could always just use fresh spinach in place of creamed spinach. Add garlic or onion for extra flavour. This recipe serves 4.